doi:10.4236/eng.2009.13016 Published Online November 2009 (http://www.scirp.org/journal/eng). gives average friction coefficient and Nusselt number higher than the respective steady-state values. ference method with non-reflecting boundary conditions. mary vortices emanating from the jet nozzle. give the best heat transfer performance. ment of air to cool a discrete and isothermal heat source. and higher than the jet exit temperature (Tc). thermal diffusivity of the fluid respectively. the flow field is considered for computational purpose. the amplitude and period of the oscillation respectively. were solved following the SIMPLEC algorithm . plicit scheme is used, which is unconditional stable. L/d = 20 and Pr = 0.71.
son of local and average Nusselt number respectively. c are not listed in the references  and . velocity on the target surface. the ninth and tenth periods is shown in Figure 3(b). 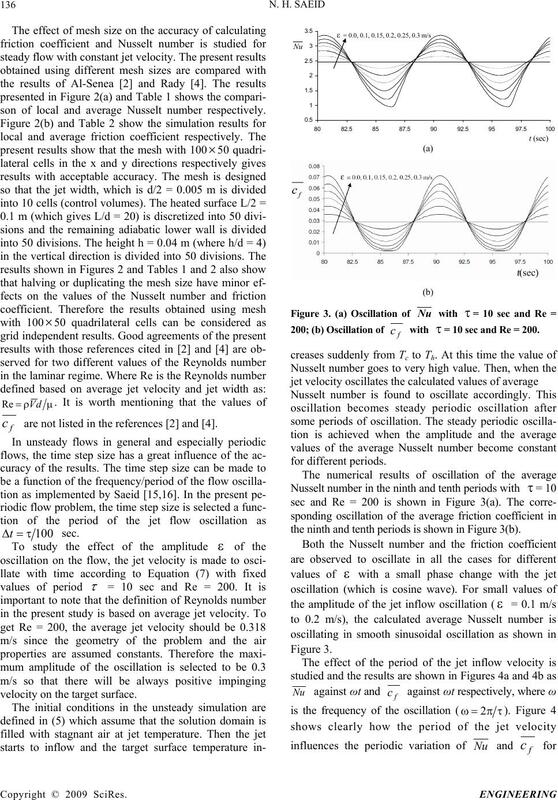 period of the jet oscillation and constant Re =200. m/s) with Re = 200. 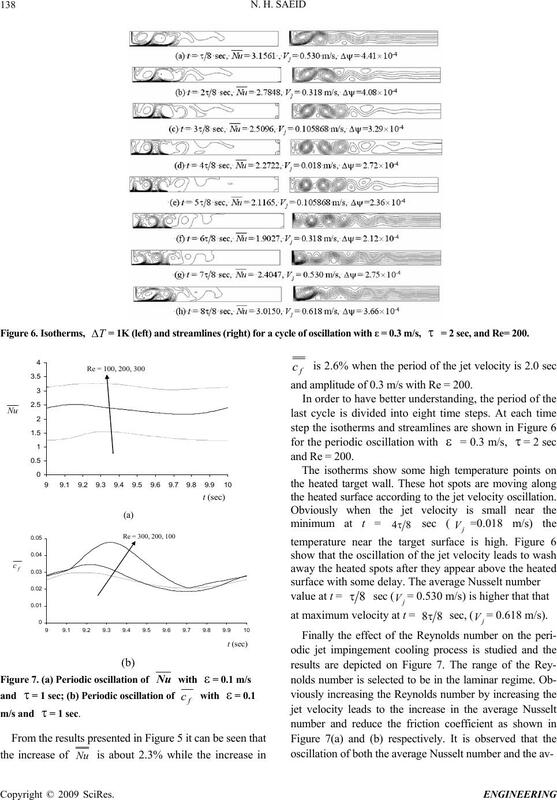 0) as shown in Figure 5.
m/s, and Re = 200.
and average friction coefficient are delayed. m/s and = 1 sec. and amplitude of 0.3 m/s with Re = 200.
the heated surface according to the jet velocity oscillation. at maximum velocity at t = 88 sec, (= 0.618 m/s). ber oscillates as a result of oscillating jet inflow velocity. the jet velocity oscillation with a small phase change. Mass Transfer, Vol. 18, pp. 597–605, 1975. Mass Transfer, Vol. 40, pp. 1095–1107, 1997.
laminar slot jet,” Int. J. Trans. Phenomena, Vol. 2, pp. Vol. 124, pp. 1049-1055, 2002. Vol. 125, pp. 243–249, 2003.
face confined by a parallel wall,” Int. J. Therm. Sci., Vol. and heat transfer in confined jet impingement,” Int. J. 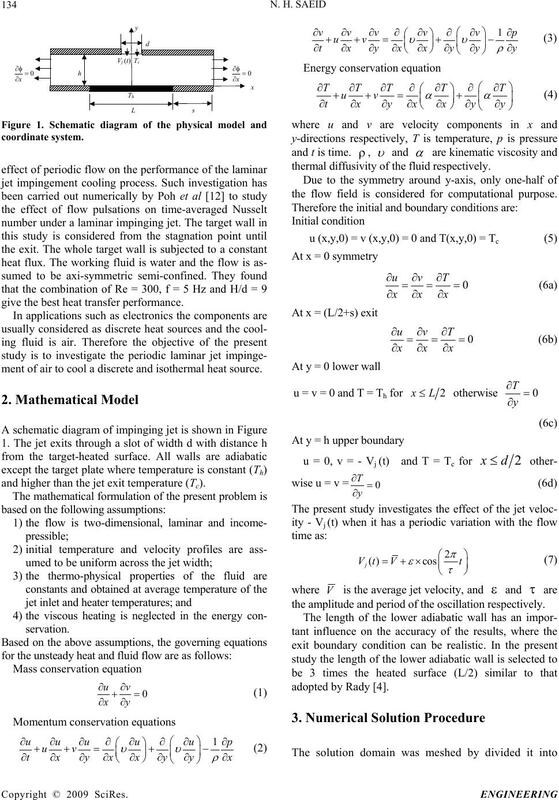 Heat Fluid Flow, Vol. 26, pp. 746–754, 2005. Mass Transfer, Vol. 45, pp. 1237–1248, 2002.
pinging jets,” Int. J. 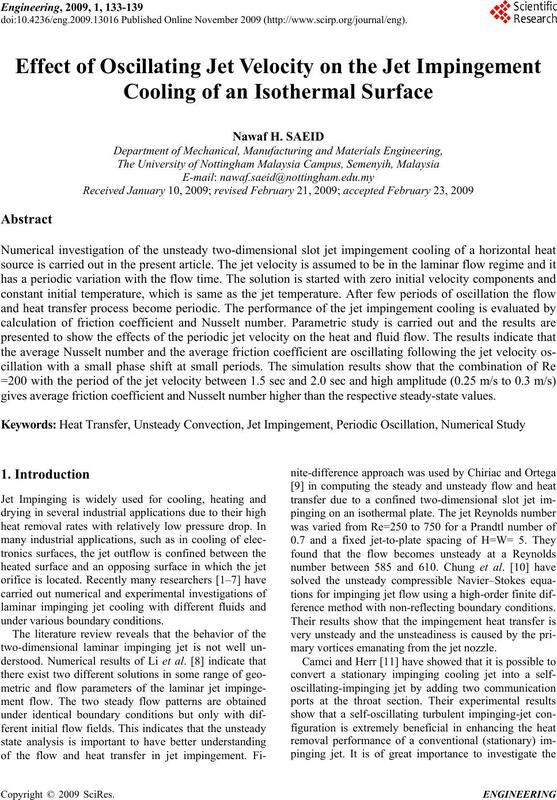 Heat Fluid Flow, Vol. 23, pp. jet,” J. 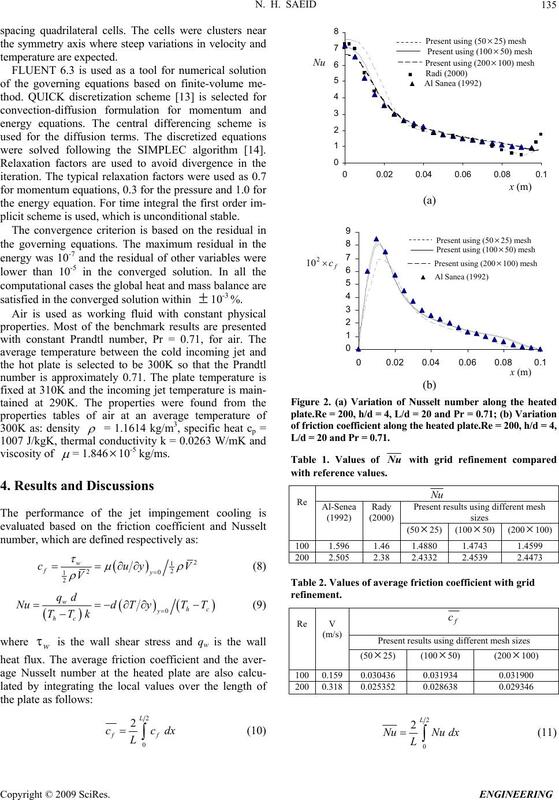 Heat Transfer, Vol. 124, pp. 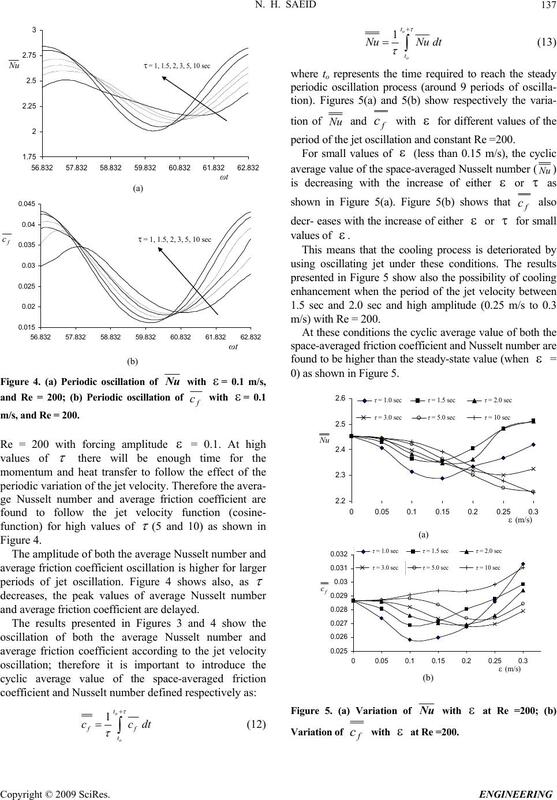 770–782, 2002.
finite-volume iterative calculation procedures,” J. Comput. Phys., Vol. 98, pp. 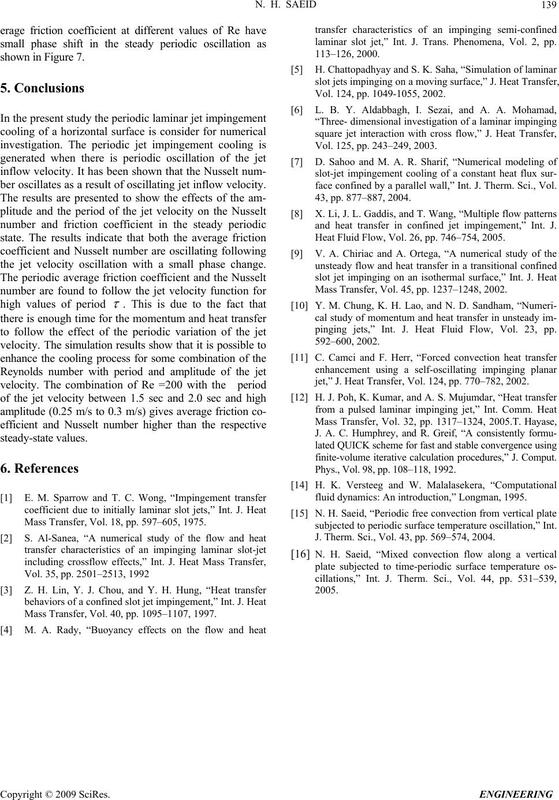 108–118, 1992.
fluid dynamics: An introduction,” Longman, 1995.
subjected to periodic surface temperature oscillation,” Int. J. Therm. Sci., Vol. 43, pp. 569–574, 2004.